Heat oven to 400°F. Line 15x10x1-inch pan with foil; spray foil with cooking spray. In small bowl, stir together 1/4 cup sugar, the flour, cinnamon and butter; set aside. Remove pie crust from pouch; unroll on lightly floured work surface. Roll into 13-inch circle. Cut crust into quarters. Place 1 peach half, cut side up, on each crust quarter. Spoon sugar mixture evenly onto peach halves. Brush crust edges with beaten egg white. Bring sides of each crust quarter up over peach; press edges to seal, making 3 seams. Place dumplings, seam sides up, in pan. Brush crusts with egg white; sprinkle with 2 teaspoons sugar. Make small slits in top of each dumpling to allow steam to escape. Bake 25 to 30 minutes or until golden brown. Cool at least 15 minutes before serving. Meanwhile, in 1-quart saucepan, stir together 2 tablespoons sugar and the cornstarch. Stir in nectar. Heat to boiling, stirring constantly; boil and stir 1 to 2 minutes or until thickened. Stir in schnapps and orange peel. To serve, place dumplings in individual dessert dishes. Top each with 1/2 cup ice cream. Serve sauce over ice cream and dumplings. 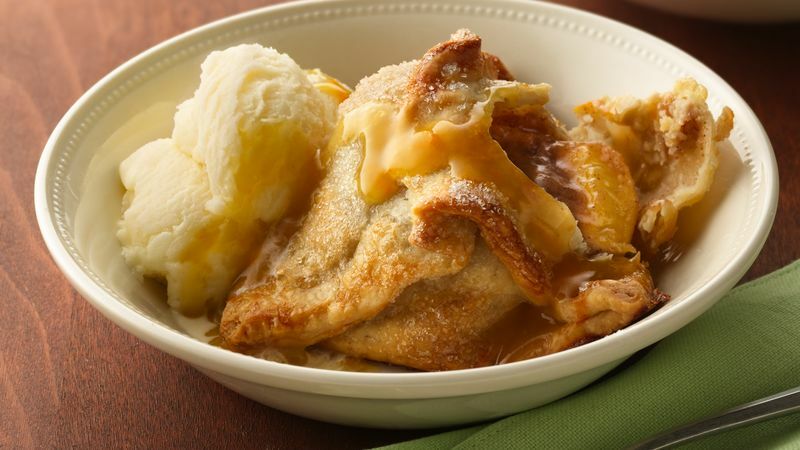 Bring sides of each crust quarter up over peach. If you have nectarines on hand, you can substitute them for the peaches.